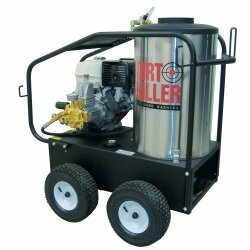 The H3612 hot water gas pressure washer, producing 3,500 PSI at 4.2 GPM, is for industrial and commercial use; perfect for the professional who cleans construction sites, buildings, vehicles or heavy equipment; powers a large flat surface cleaner; does graffiti or gum removal; engages in contract cleaning, or washes down farm machinery. There scores of gas powered hot water pressure washers to choose from but the H3612 is unique amongst in a several ways. 1) It features the unique KrÃnzle pump that can run dry and bypass better than its rivals, as proven in independent laboratory tests, and self primes. 2) It uses an electric-start 13 HP Honda LXE gear-drive engine that has reduces wear and tear on the pump by 50% while increasing torque and cleaning power. The electric start makes starting this powerful pressure washer as easy as turning a key. 3) This hot water pressure washer uses a the electricity from a 12 volt battery and the engine rectifier to run the burner motor, allowing you to generate hot water without plugging into a receptacle. 4) The four-wheel steel frame will hold up to heavy use. The H3612 comes all the accessories you need to clean to include: professional gun-jet lance, 50' wire braided hose with quick coupler connections, exit side chemical injection, gauge, four flat tip nozzle set (0 degree, 15 degree, 40 degree, soap). With a cleaning power rating of 14,700 cleaning units, the H3612 hot water gas pressure washer provides a tremendous amount of cleaning power for the toughest outdoor cleaning tasks. Measures: 46-inches length by 30-inches width by 41-inches height. Weight: 430 pounds. Metal finish.